We regret to report that Roger Eccles passed away last Friday. He was 70 years of age and had been a Full Member since 1993. Roger inherited his passion for motor racing from his father Alan, also a BRDC Member, and started racing as soon as he was old enough to hold a competition licence with a Marcos GT and Austin-Healey Sprite before having the opportunity to share one of the Sunbeam Tiger Le Mans Coupes which his father had acquired. In 1967 Roger raced an Abarth 1600 OT in British sports car events and also competed in the Spa 1000 Ks with John Fitzpatrick as co-driver only to retire with engine maladies. After a season of club racing in 1970 with an Alfa Romeo Giulia Sprint GTA, Roger did not compete again while concentrating on his business Eccles Goodridge Cast and Steel Ltd in the West Midlands. He returned to racing in 1984 with a Porsche 911 in the Porsche Production Car Challenge before embarking on three seasons with a Mercedes-Benz 190E with which he won his class in both the 1985 and 1986 Nurburgring 24 Hours. In the UK Roger finished second at Mallory Park and third at Oulton Park whilst a couple of forays to Ireland with the ‘Cosworth’ Mercedes resulted in wins at Phoenix Park and Mondello Park in 1986. 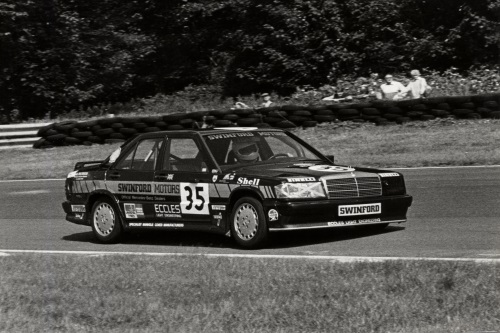 In 1987 Roger used the Mercedes for full seasons in the Monroe and Uniroyal Production Saloon Car Championships. By now it was up against the Sierra Cosworths although the year ended with third overall and a class win in the Arquati 4 Hour race at Donington Park. A very proud BRDC Member, who was a regular visitor to the Clubhouse, Roger leaves a widow, Angela, and sons Luke and Adam to whom the Club extends its sincere condolences. Roger’s funeral will be on Friday 16 June at 3.30 pm at Streetley Crematorium, 296 Little Hardwick Road, Walsall WS9 0SG followed by the Wake, to which all BRDC Members are welcome, at Swinfen Hall, Swinfen, Near Lichfield, Staffordshire WS14 9RE. The family have requested no black ties, please wear bright colours. Please RSVP to luke.eccles.uk@gmail.com if you would like to attend.